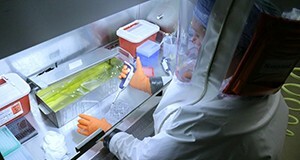 The U.S. Army Medical Research Institute of Infectious Diseases, Fort Detrick, MD, is developing novel vaccines to treat rodent-borne infections in humans. Without a doubt, the most significant technological addition to today’s military infectious disease prevention toolbox is the ability to rapidly identify pathogens through gene sequencing, and then use that information to produce key portions of the microbe to generate vaccines, diagnostic tests and therapeutics. For example, a DNA vaccine can be synthesized in a few weeks by cloning the important genes of a virus into a bacterial plasmid. This vaccine is safe for all populations, can’t be transmitted person to person and has no chance for reversion to virulence. Diagnostic tests that detect a pathogen or that measure a person’s immune response to an organism can both be derived from laboratory manipulations of the pathogen’s genes. This trend has extended to routine diagnosis in hospital laboratories, in which it is possible to take a throat swab and perform polymerase chain reaction to identify the microbe within a matter of minutes. Genomics research and the development of next-generation sequencing instruments will continue to revolutionize our awareness of potential infectious disease threats. They will also facilitate the discovery of novel pathogens while clarifying the human immune response to threats. Hantaviruses have now been identified in more than 50 species of rodents, shrews, moles and bats throughout the world. All hantaviruses known to be pathogenic to humans are carried by persistently infected rodents and are transmitted in aerosols of rodent excreta. Specific hantaviruses are carried by unique rodent hosts. These viruses don’t impact the health of the rodents, which have carried them for thousands of years; only humans are known to become ill when infected with hantaviruses. Servicemembers who come in contact with rodents during field or training exercises are at risk of infection in many diverse geographic regions. During wartime, a breakdown of infrastructure exacerbates the problem. Western medicine first became aware of the disease (then known as Korean hemorrhagic fever) during the Korean War, when thousands of U.S. and U.N. troops became ill, with some progressing to kidney failure and shock. It wasn’t until the late 1970s that a U.S. Army-funded effort led to the discovery of the virus causing this disease in Korea. The virus was named Hantaan virus after a river in Korea. Our laboratory was the first to characterize this and similar viruses, resulting in the establishment of the Hantavirus genus of viruses. The first discovery of pathogenic hantaviruses in the U.S. was in 1993, and USAMRIID again played a key role in the discovery. I was hosting a visit by a former U.S. Army lieutenant colonel, Tom Ksiazek, who had recently moved from USAMRIID to the Centers for Disease Control and Prevention (CDC) as head of their Diagnostic Section. He received a call from CDC about an unexplained severe respiratory distress outbreak in New Mexico and instructed his staff to perform several serological tests, including a test he and his colleagues at USAMRIID had developed for hantaviruses. Neither of us suspected hantaviruses as the cause of this outbreak, as the hantaviruses we work with (from Asia, Europe and Scandinavia) do not normally cause respiratory distress. A bit later, he got the news that the only positive result was with the hantavirus assay. After several repeated assays and intense rodent trapping investigations by CDC and USAMRIID, the pathogen was confirmed to be a hantavirus, but not one that any of us had seen before. This is an excellent example of an emerging infectious disease, caused by a virus that has existed in the environment for a long time, that was recognized only when the right circumstances brought it into contact with humans. Due to the importance of hantaviral diseases as well as their global distribution, USAMRIID has worked for many years to develop an effective vaccine. We and our partners at Walter Reed Army Institute of Research have recently conducted both Phase 1 and Phase 2 clinical studies of a DNA vaccine with excellent response rates in volunteers. We are working toward having this vaccine ready for emergency use in Korea if the need arises. Vaccines are the best way to prevent infectious diseases. The “pendulum” of funding agencies swings either toward vaccines or toward therapeutics, but a true balance is needed. Of course, it is desirable to have an approach for treating or curing a disease, but it is better if our Servicemembers do not acquire the disease in the first place. The sticking point, as with many other issues, is funding. Although vaccines can be developed in a very short period of time, regulatory requirements for licensing a vaccine can take many years and a lot of money. Once an effective vaccine is developed, however, the savings in terms of lost duty days, not to mention lives, are well worth it. It is very frustrating to me to have come to a point where we have an effective vaccine for hantaviruses, but money for further development is not available without investment by a commercial partner. A consistent eye on the goal, coupled with stable long-term funding, would go a long way toward improving our ability to prevent infectious diseases. For example, in the recent Ebola epidemic, treatment of patients with antibody therapy proved useful, but it wasn’t feasible for preventing the disease. Furthermore, even if sufficient stocks of the antibodies had been available to treat everyone, those antibodies had limited effectiveness late in the disease course. The ring vaccination strategy, where susceptible individuals in a prescribed area around the outbreak are immunized, is likely a good strategy for many infectious diseases. However, it was difficult to determine how effective it was against Ebola virus, since the epidemic was coming to a close by the time the vaccination effort began. It is also important to understand the disease and locale you are dealing with; what might be possible in the U.S. is much more difficult in Africa. Finally, I would like to say that the career I have had working on infectious diseases at USAMRIID could not have been more rewarding. I have constantly felt like my research is important, that I work with some of the best scientists in the world, and that I have had opportunities that I would not have had elsewhere. It is my sincere hope that the military continues to recognize the value of medical research conducted in their laboratories and finds a way to make funding of this work a priority so that the next generation of military medical researchers feel as I do. Adequate funding for military medical research laboratories would be a small price to pay for ensuring the best infectious disease preventive care possible for our Servicemembers.